Worn: 19 June 1922 - Current. The Letters "O" and "Z" above the arc represent the Ozark mountain area where the 102nd Division (the unit's former designation) was first organized. "O" + "Z" + the arc = "Ozark." Our 102nd Division Army patch is a regulation, full color, embroidered military patch. 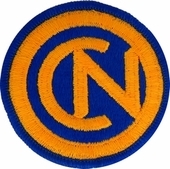 This is the same patch that is supplied to the U.S. Army, Army National Guard, Army Reserve units, and sold in the Army Post Exchanges. This patch would be a great gift idea and a wonderful addition to your patch collection.